Water stress is an ongoing concern in the state. While extreme drought is behind us for now, effects of previous drought or periods of abnormally dry conditions can last years. When trees are stressed, there are many opportunistic insects and diseases that attack them because they are less able to defend themselves. We expect that with continued adequate rainfall, trees will become stronger and more able to withstand short periods of drought and attacks by minor forest pests. However, even short periods without rainfall (less than one inch per week during the growing season) may be enough to harm or kill already stressed trees. The emerald ash borer is a non-native invasive wood-boring beetle that can kill an ash tree in approximately 3-5 years. Native to Asia, it was first found in the U.S. near Detroit in 2002 and slowly spread our direction, leaving countless dead ash in its wake. Larvae of the beetle feed on tissues beneath the bark, disrupting the ability of the tree to transport nutrients and water. Tree death occurs in 3-5 years. The emerald ash borer was first found in NC in 2013 in Granville County. Since then, it has spread to many other counties in the state. This pest has the potential to destroy virtually all of the ash trees in NC. Thousand cankers disease, which is spread by the walnut twig beetle, is a devastating disease affecting trees in the walnut family. This disease was first identified in the southwestern United States and is now found in the majority of western states. In 2010, the disease was first confirmed in the eastern United States when it was found in Knox County, Tennessee. In the East, thousand cankers disease is now found in Tennessee, Virginia, Pennsylvania, and most recently North Carolina. 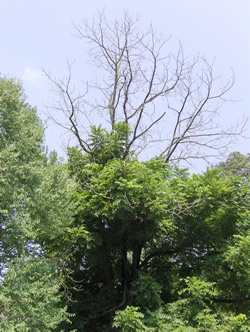 This disease was confirmed killing walnut trees in Great Smoky Mountains National Park in Haywood County, North Carolina in late 2012 and is not known to occur in any other counties in the state. Quarantines limiting movement of walnut wood into North Carolina from other states as well as movement of walnut wood out of Haywood County are currently in effect. Laurel wilt is a disease of redbays, sassafras, and other plants in the laurel family. Native to Asia, the redbay ambrosia beetle carries the fungus that causes this disease from tree to tree. Since it was first discovered in the U.S. in Georgia in 2003, the disease has spread throughout the southeast. In South Carolina, Georgia, and Florida, it has killed more than 95 percent of susceptible trees in infected stands and has gained the attention of forest pathologists for its ability to kill healthy, mature trees in only a few weeks. Redbay trees are the most frequently attacked, but other plants in the laurel family (e.g., sassafras, spicebush, pondspice, pondberry, and avocado) are also susceptible. 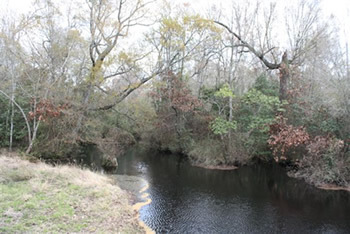 This disease was confirmed killing redbay trees in North Carolina in 2011 and is currently only known to exist in Bladen, Brunswick, Duplin, Columbus, New Hanover, Pender, and Sampson counties. Laurel wilt can spread within the state naturally through beetle dispersal or through movement of beetle-infested wood such as firewood used for camping. The southern pine beetle (SPB) is North Carolina's most destructive forest pest. From 1991 through 2002, the beetle killed at least $84 million worth of timber in North Carolina. Most of the damage during this outbreak occurred in the mountains and western piedmont areas. Since then, activity has been low. 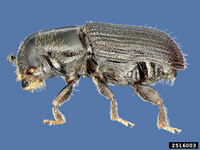 Southern pine beetles are smaller than a grain of rice, but have caused great destruction in southern pine forests. The pests bore through the bark, feed on the inner bark tissue and eventually kill the tree. While the pest's attack on North Carolina pine trees appears to have subsided throughout the state, prevention efforts remain important because the insect periodically increases to epidemic proportions for reasons not entirely understood. An SPB Prevention Cost Share Program was initiated in 2005 to assist landowners in thinning un-merchantable stands (reducing stems per acre or basal area) and other stand improvement work to create stands that are at lower risk for SPB attack. The Southern Pine Beetle Prevention Program, funded through a grant from the USDA Forest Service, will reimburse non-industrial private forest landowners in North Carolina for some of the cost of pre-commercial thinning of pine stands. During a pre-commercial thinning, trees with no commercial value are removed in order to allow remaining trees to grow with less competition for food and sunlight. Such thinning improves the health of the remaining trees and reduces the stand's susceptibility to SPB. To apply for assistance, a landowner can contact his/her county forest ranger who can provide an application. In order to qualify, a forest management plan must be approved by the N.C. Forest Service. This plan will need to provide guidelines for managing the pine stand. Plans can be written by N.C. Forest Service staff or a consulting forester. Each landowner can receive reimbursements through the program for up to $10,000. The program will reimburse landowners for 50 percent of the prevailing rate for the pre-commercial thinning or 50 percent of the actual cost to perform the work, whichever is less. The entire state of North Carolina has been monitored for gypsy moth since 1982 through a cooperative effort of the N.C. Forest Service and the N.C. Department of Agriculture and Consumer Services - Plant Industry Division. Since then, more than 100 intervention programs have been initiated to either eradicate isolated populations or suppress populations close to the leading edge of the gypsy moth's advancing front. Although destructive populations of the gypsy moth do not currently exist in North Carolina, each year new colonies are detected throughout the state and subsequently treated. This highlights the ever-present risk that permanent establishment may occur. 2016 trapping results which show the majority of advancing gypsy moths caught in northern North Carolina. 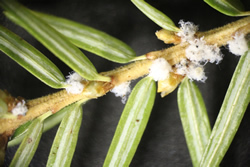 Infestations of the hemlock woolly adelgid infests the entire native range of both eastern and Carolina hemlocks in the state. Mortality is very apparent in infested areas and will likely continue to increase during the next several years. The use of systemic insecticides has been the primary control method used on state and private lands and limited release of several species of predatory beetles has occurred on state forests. Most management efforts are limited to urban landscape trees and trees of high aesthetic, historical, or sentimental value on both public and private lands. Treatment on public lands is primarily on trees near visitor centers, campgrounds, scenic road and trails/trailheads, and near certain streams. Efforts to locate and/or breed a resistant tree are ongoing. However, the adelgid continues to outpace control efforts. Forest ecologists note that the insect endangers the very survival of both eastern and Carolina hemlocks throughout the range of these species. Because of the hemlock's important role in riparian ecology, the loss of this species could have a devastating impact on forest ecosystems. Sudden oak death is a disease of concern that was introduced to California, Oregon, and Washington, and has the potential to spread into the Southeast through the importation of infected nursery stock. In 2003, surveys for the disease in North Carolina were initiated as a result of confirmed shipments of infected nursery stock to the state and they continue to take place twice a year. Currently, numerous streams throughout the state are monitored for the spores of Phytophthora ramorum, the pathogen that causes sudden oak death, because the pathogen can spread in streams and rivers. Phytophthora ramorum has been found in several nurseries in the state, but quick action has resulted in effective eradication of the organism at most sites. Despite the presence of the pathogen, the disease has not been found on living vegetation outside of the nurseries or in any forested areas in North Carolina.